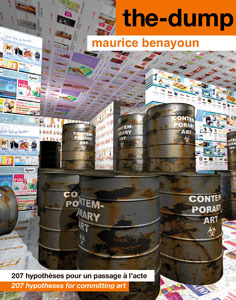 French media artist Maurice Benayoun is way ahead of today's economists. He long ago figured out that collective emotions trackable on the Web might be used to predict market ups and downs. Recent books like Animal Spirits: How Human Psychology Drives the Economy echo the notion that the market has become a histrionic arena that begs for regulatory controls, and there is at least one hedge fund that uses the analysis of mass tweets to make stock predictions. 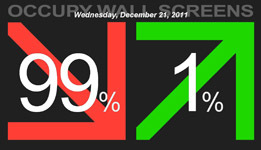 But Benayoun is no Wall Street gambler trying to game the system. He hopes his recent work will in fact aid and engage the Occupy Wall Street movement, which he says is still more potent in the U.S. than in Europe -- though not for long. This week Benayoun arrives in Manhattan to unveil the latest in an ongoing multimedia series called "The Mechanics of Emotion" -- a 15-part opus which grew out of the idea that the Internet is the world's nervous system, and that messages sent between users crossed "zones of pain and pleasure" near and far. 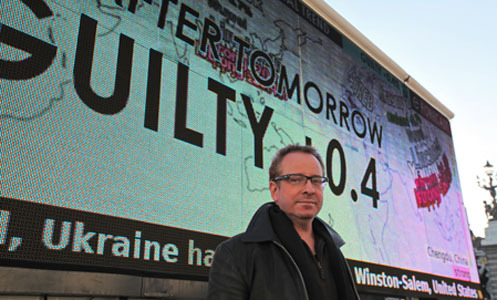 Using various analytic and graphic tools in his ever-evolving tech arsenal, he set out to map the world's emotions. In one part, he created a series of "frozen feelings" -- machine-made sculptures of digitally carved disks in various materials. Each disk bore a topographic pattern that corresponded to real-time Web data which inventoried emotional states in the 3,200 biggest cities on the planet, by tracking word clusters (ecstatic, angry, terrified etc). These have been exhibited around the world (including Shanghai), presented first as religious relics and then as luxury items. Notes Benayoun, "The paintings and statuary of the Church ended up in the homes of collectors." 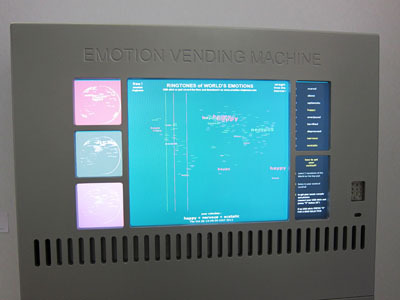 He also built an "emotion vending machine" that dispenses "musical cocktails" based on selected emotions, which offers a wry twist on art's ongoing critique of runaway consumerism. The project is really a result of Benayoun's desire to humanize subtler new technologies, albeit on a global scale that suggests a political dimension. He is asking questions about who inhabits the brain of this nervous system and who profits from it. How dependable and unmediated by special interests is the information it gives us? "Beyond technology isn't it people trying to have a better life?" He also sees "The Mechanics of Emotion" as a metaphor of the art world, and how it transforms human values and vagaries into investment commodities. 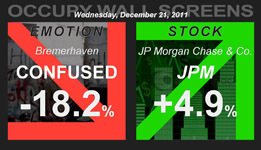 In the series' latest incarnations, Occupy Wall Screen and Emotion Forecast juxtapose stock-valuation readouts of selected financial institutions (deemed responsible for recent economic crises) with the collective emotions of places that have held OWS-type events. Beginning January 31, it will appear writ large on the Big Screen Plaza outdoor screen in mid-town Manhattan, across from the Eventi Hotel. Using an iconography that mixes stock-market numerology with TV news, Benayoun seeks to contrast the avarice of the 1% with the humanity of the 99%. He also has some radical ideas about Wall Street machinations, advocating, for instance, for regulation that would impose a one-day delay on all trades -- to mitigate the emotionalism that the instant-trade market has ratcheted up to damaging levels. Although Benayoun is a Parisian born in Algeria, it's more to the point to say he's a pioneering international media artist. Having mined the digital-into-art realm since well before most others, he is revered in his field and spends much of his time exhibiting and lecturing abroad. "Defining myself is always a difficult question because I've changed my title many times. Multimedia explorer, artiste plasticien, conceptual artist... and now I just say Open Media artist -- the result of the evolution of the media the artist can use. We don't have to use just painting and sculpture anymore; we can use video, film, Internet, virtual reality, augmented reality, installations and so on." Benayoun is probably France's most cutting-edge artist, in that he is usually absorbed with whatever new visual technology is emerging in ways accessible to artists, beginning with 3D animation in the early 1990s. But he doesn't just tinker with these new toys to show off their cool tech-fair features; he seeks ways to make them enlighten us about society, perception, human behavior and other weighty matters he likes to ponder. He's a thinker first, and technology is just a means to a dialectic end that asks more questions than it answers. He likes to connect, as he says, philosophy, poetry, politics and art... perhaps a very European tendency, melding disparate layers in the way the continent's oldest cities do. Benayoun naturally thinks in "world scale" as he calls it, and navigational tools are an essential component of his works... to go beyond image to experiencing a world that is trying to be meaningful. The last time he hit New York was with one of his many interactive installations -- called World Skin: A Photo Safari in the Land of War. 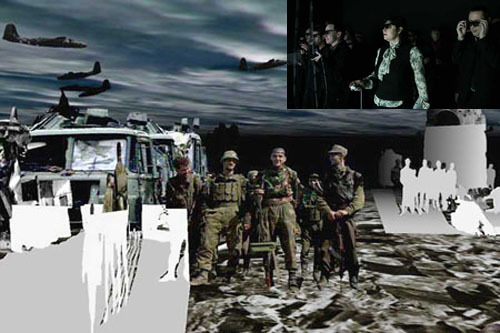 Typically immersive and elaborate, it involved lending cameras to visitors for the purpose of "erasing memories by taking photos of photos" of WWII and the Bosnian War, as they made their way through a harrowing 3D environment. Benayoun is a prolific artist and his works are too numerous and layered to describe here with any thoroughness, but a few ought to be mentioned. As an indication of his stature in France, he was invited to create a permanent on-site installation for the 200th anniversary of the Arc de Triomphe. He took the opportunity to make a rather subversive point about the obsolete imperial gesture of war monuments. Another signature piece was Tunnel Under The Atlantic, a symbolic but working link between museums in Paris and Montreal. He employed "tele-virtuality" and artificial intelligence to achieve a dialogue between users 3500 miles apart. It was later re-cycled to create Paris-Delhi. In Cosmopolis, a complex meditation on urbanism which travelled to four cities in China, viewers entered a large dynamic 360˚ panorama comprised of scenes from a dozen major Asian and Western cities. As one peered through observation binoculars, their views were captured and added to a hypothetical new city that was slowly, cumulatively built from bits of existing ones. "The City of Tomorrow must be the fruit of intersecting gazes and experiences." Some artists hoard their ideas, thinking them a rare and precious fuel. But Benayoun, who loves nothing more than to argue concepts over a bottle of fine wine, has more ideas than he can possibly execute. So he engages in what he calls transactional creation, whereby people freely exchange ideas and images that cross-pollinate and result in works that are in effect time-release collaborations. He founded "The Dump," a bilingual Web repository for conceptual-art projects that remain open for anyone's use. As a tongue-in-cheek act of academic satire, Benayoun made this his doctoral thesis at the Sorbonne. "I was getting a degree for a blog about things I'd never done." This led to a forum in Poland filled with artists who had actually realized some of those ideas, or at least been inspired by them. It was another example of Benayoun deploying the new information networks in ways that stretched or demolished the domains that artists had been used to fitting into. Below is a glimpse of how Maurice Benayoun thinks aloud. CALENDAR NOTES: Streaming Museum, an international public art and online museum, will celebrate its fourth anniversary on January 31 with the U.S. premiere of "Emotion Forecast" and "Occupy Wall Screens," real-time artworks by Maurice Benayoun. 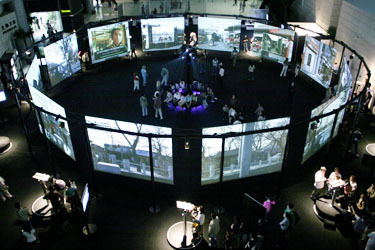 The exhibition will be on view for one month at Big Screen Plaza in New York City and through 2012 at StreamingMuseum.org. The opening reception will take place from 6 to 8 pm on January 31 at the Eventi Hotel's Bar Basque, designed by futurist Syd Mead (839 Avenue of the Americas). Benayoun will also give a lecture at Parsons the New School for Design on February 1 and Columbia University on February 2. Michael Kurcfeld is a documentary producer and journalist based in Los Angeles and Paris. Click here for his website.